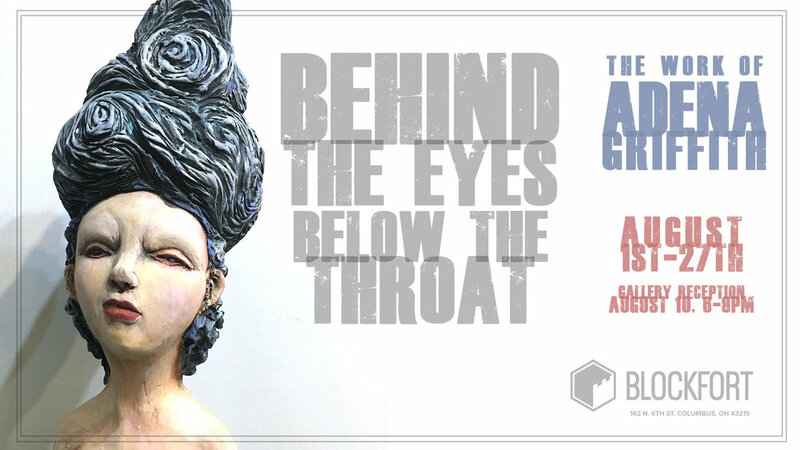 Blockfort is pleased to host the exhibition "Behind the Eyes, Below the Throat", featuring the work of artist Adena Griffith. “Behind the Eyes, Below the Throat” is the most recent body of sculptural work by Adena Griffith. Adena is an artist from Westerville, Ohio who has been working in clay for over 15 years. The inspiration for this exhibition of 20+ figures at Blockfort Gallery comes from her battle with depression and anxiety. Each sculpture is a narrative from moments of dealing with the beginning depresson and into her postpartum depression and anxiety over the last couple of years. Adena uses the female form and symbols from nature to express times when the battle of the mind and heart seem to never cease. Her hope is to let her viewers know they are not alone in the struggle, that everyone has those dark moments but we need to stay alive.